Algeria has bought Mil Mi-26T2 heavy helicopters and Mil Mi-28NE combat helicopters from Russia, a foreign specialized website has reported. 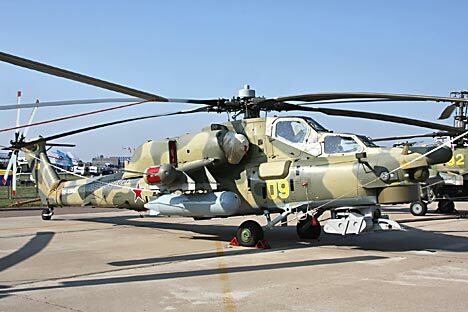 Algeria will be supplied with six Mil Mi-26T2 heavy helicopters and 42 Mil Mi-28NE Night Hunter combat helicopters under a $2.7 billion contract, which also envisages modernization of 39	Mil Mi-171Sh helicopters, the report runs. The website said that Russia had begun to implement the contract. Mil Mi-26T2 helicopters built by the Rostvertol plant, a unit of Russian Helicopters Holding, will be delivered in two batches, three helicopters in each. Algeria's Mil Mi-171Sh helicopters will be modernized by the Ulan-Ude aircraft plant of Russian Helicopters Holding. The modernized helicopters will be carrying new armaments. Interfax-AVN has yet to obtain confirmation to this report from Russian arms exporters.